Jan Flagg was a woman with a vision. In Jan's world, no dog would go homeless or hungry. 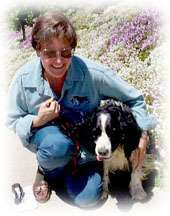 And while she loved all dogs, Jan's passion for English Springer Spaniels led to her founding of ESRA. Because of her drive and dedication, several hundred Springers are rescued and rehomed each year, all over the United States. But Jan's vision went farther than that. Within Jan's heart was a special place for dogs who especially need our help: senior, severely ill, or injured Springers. These dogs regularly turn up in shelters nationwide. And the shelters, which are faced with dwindling budgets and severe overcrowding, rarely have the resources to help them. With no place else to turn, ESRA is usually the last ray of hope for these special dogs. The Jan Flagg Memorial Fund has been established by the Flagg family and ESRA to help provide rescue and medical care for senior, critically ill, or injured English Springer Spaniels. Please help us perpetuate Jan's legacy. All donations are tax deductible, and a receipt will be provided.